We offer Clean, Timely, Courteous & Comfortable Shuttle Service throughout the Buffalo and Western New York area, providing services to most medical and patient service facilities. 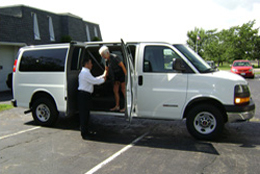 Let us provide you with fast, friendly, personal service for all of your personal and medical shuttle needs. It is our goal to ensure the complete satisfaction of every customer, while offering knowledgeable and friendly service at affordable but competitive rates. Call Buffalo Shuttle Service, Inc. at 716-662-9400 for all your personal & medical transportation needs!